The new generation of Maori activists are almost all university educated, media savvy and well travelled. Most are anti-capitalist and have connections to the revolutionary socialist movement and the global NGO network. Tauni Sinclair fits the bill on all counts. In 1991, Maori activist Eru Potaka-Dewes established the Aotearoa-NZ Action Committee's Alternative Immigration Office. ANZAC acted as a Maori "immigration centre", for the "solidarity of indigenous peoples" and "empowering us" about who comes into country. ANZAC issued its own "passports" but was not well received by the government of the day and did not last long. Tauni Sinclair was ANZAC's secretary in 1992. By 1994, Tauni Sinclair was a leader of Auckland University's radical "Te Kawau Maro" Maori rights organisation. 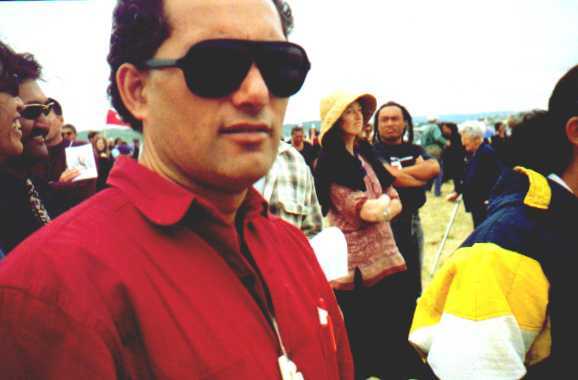 In 1995, Sinclair represented the Auckland University Students Association at the Motua Gardens Maori land dispute at Wanganui. The same year, in Craccum 24, Sinclair praised the universities two main communist groups, Radical Society and Workers Power for "educating and decolonising students". In mid '96 as AUSA Maori Student's officer, Sinclair attended a week long NZUSA/Te Mana Akonga conference in the Manawatu. Sinclair introduced a speech by a Cuban revolutionary soldier, Leonardo Numen. According to Craccum 13, Sinclair went on to talk about a political training camp in Cuba over the Xmas break and invited people to "check me out" if interested. "The gathering was hosted by Te Kawau Maro, a group of Maori rights fighters on the campus. Tauni Sinclair, the chair for the meeting, announced that he and three other members of the group planned to visit Cuba next January to see the realities of the revolution for themselves." In April 1998 travelled to Geneva for a conference organised by the UN Commission on Human Rights. In May '98 Sinclair was listed as a contributor to the Peoples Network's "Common Ground" magazine. The People's Network, co-led by current Green MP, Sue Bradford, largely consisted of members of Radical Society, ex members of the Workers Communist League and "Liberation Theology" Catholics. In 1999, Sinclair produced a documentary, "Globalisation and Maori". After an initial introduction to Māori history and traditions, respected lawyer Moana Jackson makes comparisons with early colonisation and current globalisation, canvassing everything from the economic policies of the 1984 reform Labour government to the role of the IMF, World Bank and corporations in the global economy. Following this is a specific analysis of the global economy by international environmental ecologist, Dr. Edward Goldsmith. Author of several books on the global economy and corporations, Dr. Goldsmith is familiar with the New Zealand context and warns of future global suffering, particularly indigenous peoples. Māori lawyer Tauni Sinclair and Auckland University Associate Professor of Law Jane Kelsey add an overview of international trade agreements and their effects on local economies. In June, 1999 Sinclair attended the International Conference on the Rights of Indigenous Peoples at the National Taiwan University, Taipei. In 2000 Sinclair wrote a documentary on the police shooting of a young Maori man, Steven Wallace. The killing, which was found to be in self defence was a major issue in NZ at the time and was made even more prominent by the protests of several Marxist and Maori radical groups. In Mid 2000, Sinclair joined ex-communist Tame Iti and Piripi Haami on a fact-finding trip to Fiji. Ethnic Fijian businessman, George Speight had just ousted the leftist and Indian dominated government of Mahendra Choudry in Fiji's third coup. This coup divided the NZ left, most of whom backed Choudry and his crypto-communist Fiji Labour Party. Some Maori leftists backed the coup, because they saw it as a case of indigenous people overpowering foreign interlopers-in this case Fijian Indians who had lived there for 100 years. Iti, the leader of the group, is well known in New Zealand. With his face heavily tattooed in the traditional Maori moko style, he is frequently on hand at Maori land rights protests. Standing alongside Speight in Suva, he said the trio fully supported the rights of indigenous people to regain their power and govern themselves. This was endorsed by Sinclair, who said that he applauded the coup. Grossly misrepresenting the character of the events in Fiji, Sinclair proclaimed, revolution is a very legitimate part of the democratic process. There's only one condition, you must succeed. Comparing the situation in Fiji with that of New Zealand, Sinclair said that were the Maori population more numerous, similar actions as Speight's would be on the agenda there as well. Speight concurred, saying the Maori were not as fortunate as he. If Maori were 50 percent [of the population] it would probably be a different picture over there. In September 2000, Sinclair signed a press release with Helen Te Hira, Teanau Tuiono and Maria Bargh, protesting the proposed Singapore/NZ Free Trade deal. In February 2001, Sinclair visited Teheran for a UN funded NGO Forum. The forum was organised by the Organization for the Defense of Victims of Violence. The NGO Forum began with a panel discussion of the issues of Migrant Workers, Caste, and Indigenous People. The presenters in the panel were Irene Fernandez, Tauni Sinclair, and Martin Chhotubhal Macwan, well-known activists in the region and internationally. The panel discussion was very enriching as they provided participants with an overview of major issues of discrimination in the Asia-Pacific region. "...its importance to the UN system was marked by the high level turnout including the UN Secretary General Kofi Annan, Deputy Louise Frechette and five heads of UN agencies. Virtually all the key UN agencies were represented. The indigenous delegations were dominated by those from North and South America but there was also a good smattering of representatives from Asia, Africa and the Pacific including New Zealand. Tauni Sinclair of Te Kawau Maro, Tara Tautari of the World Council of Churches and Laures Park of the New Zealand Education Institute...."
Fotunately though Sinclair does seem to believe in property rights. 12:00pm at the Porirua Shopping Centre, Maori and supporters will hold a protest at a Chinese emporium which is copying symbols and designs belonging to Maori and Pacific Island peoples. These designs include The Maori Party Logo, Tino Rangatiratanga Flag, counterfeit Dawn Raid designs, and designs from individual Maori and Pacific Island artists. The Chinese operators have been approached to stop such theft. They have replied in an insulting and disrespectful way. They have stated on occasion that some of our people are now been targeted by them, 'marked man’ styled threats. They also plead 'No English’ where convenient. These operators undermine our development and have the cheek to threaten us with legal action! Is this what we receive from allowing these people our country and hospitality? Is this what we can expect with 'closer free trade agreements’ with China? • We call for a nationwide boycott of all Asian products using Maori symbols, this includes fake bone, greenstone and stolen designs. • We urge our people to protect our intellectual property by exposing and closing these people down who are using tribal names with impunity, names such as ‘Nga Puhi’, ‘Te Arawa’, ‘Ngati Porou’! Wish I'd known. I'd have been there supporting Tauni and the crew. Why isn't this brownie in gaol? Why is this dickhead commenting on my blog? What a joke. Trev the feraless anti-commie comes out in defence of one. Typical for Act - the pseudo-freedom party. You're all statists at heart. Sounds like I've got a fascist troll on the blog anon. Great writeup, he was a great activist in his day. Nyquist on the "Destruction of the United States"